As Thanksgiving ushers in the holiday season, along with it come some of the busiest travel days of the year. The TSA anticipates that over 2.4 million people will be making their way to airports across the country in the days leading up to Thanksgiving, with more passengers expected in December. That means travelers can expect a chaotic environment as people hurry in and out of different terminals, fumble with their luggage, wait with frustration in long lines and sprint to their gates or taxis. Through the frenzied rush, it’s likely that travelers will have their blinders on as they try to navigate the crowds and reach their destinations. However, while getting there on time is the goal, making sure everyone remains safe while doing so is key. LAAPOA reminds everyone traveling this season — whether by air, rail, sea or road — that it’s important to always be aware of your surroundings, especially at a time when large areas where many people congregate, such as airports and shopping malls, are most susceptible to being targets of terrorist attacks or mass shootings. As we have seen this year, active-shooter situations and attacks by extremists have sadly become a common occurrence in our society. The devastating mass shootings in Las Vegas and Sutherland Springs are indicative of how unsecured public venues are prone to attack. Meanwhile, recent reports of the TSA’s disconcerting security gaps underscore that airports remain vulnerable to both inside and outside threats. The Department of Homeland Security has further reminded us that terrorist organizations, like ISIS, still view airports as primary targets to inflict harm. In anticipation of the high volume of travelers and persistent threat of attacks, airport peace officers across the nation will be working around the clock to make holiday travel as smooth and secure as possible. LAAPOA would like to express gratitude to all of our members and colleagues who work tirelessly and selflessly to keep our communities safe. We hope that the public will be mindful of the many ways in which law enforcement officers go above and beyond in the performance of their sworn duty — not only during this holiday season, but each and every day of the year. Even with officers on patrol, LAAPOA urges the public to be on the lookout, wherever you are, and report any suspicious activity to the nearest law enforcement personnel. And for those not traveling far from home, the holidays bring an increase of unwelcome crime, such as theft and DUIs. We encourage everyone to review these helpful holiday safety tips with their families in order to be prepared for any danger that might disrupt your festivities. The safety of travelers and those in our community is of paramount importance to us. We are thankful for the opportunity to serve, and for everyone who continues to support our mission to protect our airports and our city. 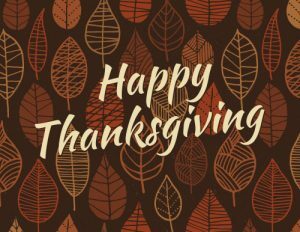 LAAPOA wishes you a very happy Thanksgiving!